A husband and wife from Mountain Lake recently were cited by DNR Enforcement for a crappie overlimit of more than 250 fish, according to the report from a CO. (Photo courtesy of Minnesota DNR)Windom, Minn. — A married couple from Cottonwood County was cited recently for possessing a crappie overlimit that totaled 253 fish – once the legal limit of 10 per person was subtracted from those Minnesota DNR conservation officers say they found at the couple’s residence, as reported in the July 27 issue of Minnesota Outdoor News. Dustin Miller, a state CO based in Windom, said that on May 20, he and two other COs seized several bags of fish from 70-year-old Isouvahn Xayachack and his 60-year-old wife, Chanhthone Phongsim, at their apartment in Mountain Lake. The next day, Miller wrote in his report, the fish were thawed enough to count: 93 “butterflied” crappies and 160 whole crappies. Miller said the officers left Xayachack and Phongsim with 10 fish apiece – the legal crappie limit in Minnesota. Then, both were cited for having 126 crappies (one taken out of the mix for an even number) over their respective limits. In an interview with Outdoor News, Miller said that in addition to fines levied for overlimits, the couple would be subject to restitution. Enforcement officials say the fines could reach $3,250 per person. With another $630 in restitution, the cost of each overlimit could be $3,850. “It’s a prime example of people going out and double-tripping,” he said. The case began when CO Mike Gruhlke, of Jackson, received a TIP call at about 7 p.m. on May 20. The caller said she had witnessed several people taking overlimits of crappies from Sisseton Lake in the city of Fairmont in Martin County, according to Gruhlke’s report. The officer responded to the area but failed to find the suspects. He did, however, receive license plates numbers for two suspect vehicles from the TIP caller. “She (the caller) said they had left around 6:57 p.m. and they had crappies in plastic grocery bags that they took to their car(s). She figured that they had 100 or more crappies when they left. She stated that there were six people …,” Gruhlke’s report says. The caller also noted two vehicles’ license plate numbers. Sisseton is a 140-acre lake located in the city of Fairmont. It’s situated between Budd Lake and Lake George. Initially, according to Miller’s report, the couple stated they’d caught 17 crappies that day and had given them to a friend in Mountain Lake. They also said they’d been fishing with four other people, some of whom Xayachack had warned not to keep overlimits. The first freezer checked in the couple’s apartment didn’t contain fish, according to Miller. The second contained several packages, he said. “We completed laying out the packages and I photographed them,” Miller wrote in his report. “I allowed (Xayachack and Phongsim) to keep their legal possession limit of 20 crappies. 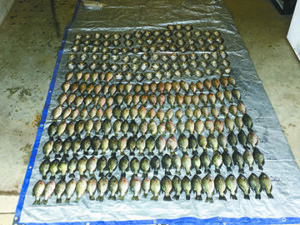 Miller said he was uncertain if the crappies that were seized came from the same lake, as not all of them were frozen. “Essentially what we came across were crappies in the whole,” he said. The COs thereafter interviewed others who’d been identified as those fishing with the Mountain Lake couple. No other overlimits were located, though one angler – 48-year-old Kaew Chakvong, of Mountain Lake – was issued a citation for failing to have a valid fishing license. Lol. Little over the limit there. My understanding from the way that article read is that you have to eat your limit before catching another limit. Am I reading that wrong? I can't speak for MN but in Ohio you have a daily bag limit and a possession limit. The possession limit is 2 daily bag limits. This includes the freezer at home. But in Ohio you are lucky to catch a bag limit in a summer of fishing.....with the exception of Lake Erie. I am from Minnesota and you are correct. Your daily limit includes what is in your freezer. This happens with some frequency up there and tends to be folks of Asian decent. Pretty sure it's the same here. Something like your only allowed a days limit in your freezer or something like that. What really bothers me is every time I see these articles about people getting caught keeping excessive amounts of fish over the limit they are always foreigners. Its a real shame that they don't respect our conservation over here, I guess it's just cultural difference idk.